More important than unemployment for apartment building investors? Source: http://www.duprescott.com Note that we compressed Mike’s four charts into one for brevity. 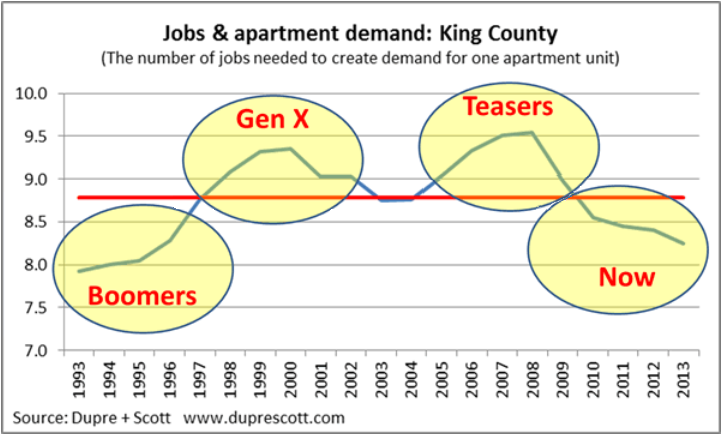 The formula is simple: Net new jobs / apartment units absorbed. 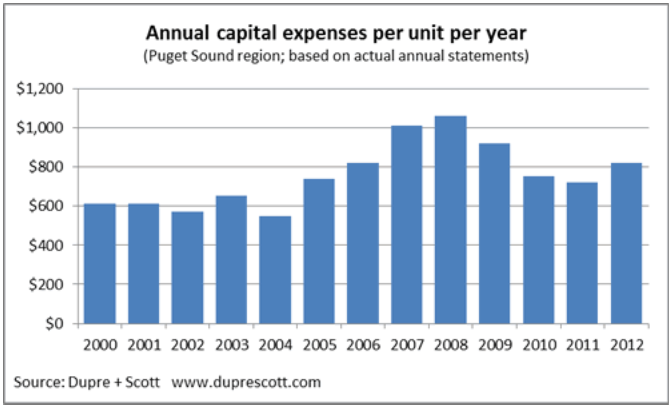 And if you’re an multifamily investor in the tri-county area (King, Pierce and Snohomish in WA State) that Dupre+Scott provides apartment investment research for, they’d be happy to supply you this information http://www.duprescott.com. Looking at the chart we can see that while currently it takes about eight jobs to fill one unit it wasn’t always so and in fact the twenty year average is closer to nine. Mike explains Continue reading More important than unemployment for apartment building investors? Posted on August 5, 2013 August 5, 2013 Categories Apartment Building Investment Cycle, Multifamily Design & Development, Multifamily Investments, The Economy and Current AffairsTags absorption, Apartment Building Investing, apartment building investment cycle, apartment demand, Dupre + Scott, Dupre+Scott, employment growth, King County, multifamily development, Seattle, trends, unemploymentLeave a comment on More important than unemployment for apartment building investors? 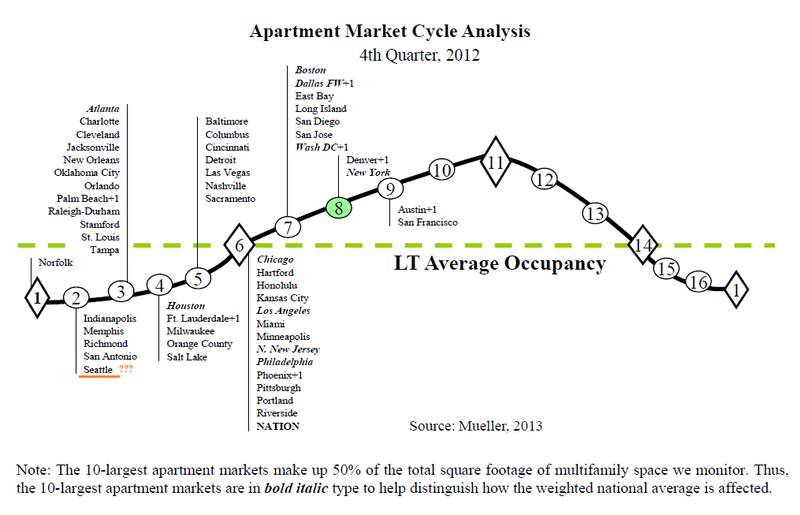 Latest Commercial RE and Apartment Building Investment Cycle Charts Posted by Glenn Mueller PhD. Is it a Seattle thing? Is he the Brent Musburger of commercial real estate? Continue reading Latest Commercial RE and Apartment Building Investment Cycle Charts Posted by Glenn Mueller PhD. Posted on March 14, 2013 October 27, 2014 Categories Apartment Building Investment Cycle, Multifamily Design & Development, Multifamily InvestmentsTags absorption, Apartment Building Investing, apartment building investment cycle, Apartment Dynamics, apartment market cycle, asking rents, commercial property, concessions, CRE, Dupre + Scott, effective rents, Glenn R. Mueller PhD, Kidder Matthews, Market Cycle Analysis, market rent, MPF Research, multifamily development, new supply, occupancy, Seattle Times, vacancy1 Comment on Latest Commercial RE and Apartment Building Investment Cycle Charts Posted by Glenn Mueller PhD.